A beautifully maintained park known for the Maori settlement history, the MJ Savage Memorial Park pays tribute to the first Labour Prime Minister of New Zealand- Michael Joseph Savage. 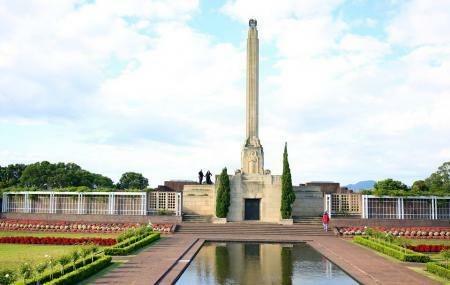 The memorial offers a panoramic view of the Rangatira reserve, the serene Waitemata Harbor and the skyline of Auckland city. Do take your time as you walk around to admire the neat flower beds and the pathways that run around the memorial. Admission to the place is Free. How popular is Michael Joseph Savage Memorial Park? People normally also visit Coast-to-coast Walkway while planning their trip to Michael Joseph Savage Memorial Park. Love the change of seasons and how the same setting can look different. If you don't have much time in Auckland but need a couple of good photos, this is a good place to start. The view of Auckland City or skyscrapers is amazing from here. It's at top of mountain and got lush green garden. You can have a look around of 360 from here. Great location, amazing views, and a beautiful garden. You can even find an abandoned bunker in the stand of trees. My family usually visits this park when we are in the area. Definitely worth your time! Fantastic scenic views as well as the lovely gardens & memorial to walk around. Great for picnics on a sunny day. There are also toilets. The Koi cafe is there as well but I haven’t been to it so not sure what it is like. Beautiful well maintained park overlooking mission bay. Splendid flowers and greenery looking to the most spectacular views that Auckland has to offer. Quiet and screen. Toilet block if your caught short and a lovely cafe that will be swamped come summer. A nice place for a picnic.